Minister of Culture, Gender, Entertainment and Sport, Hon. Olivia Grange (left), greets Director of Business Development and Communication, Management Institute for National Development (MIND), Marlene Campbell (right), while Programme Manager, Cuso International, Roberta Ellis, shares the moment. The occasion was a business forum in commemoration of International Women’s Day held recently, at the Knutsford Court Hotel, New Kingston. The Government intends to introduce legislated gender quotas to address the lack of proportional representation of women in Parliament and other areas of the society. The move is part of Temporary Special Measures (TSMs) on the part of the Government to accelerate equality between men and women. 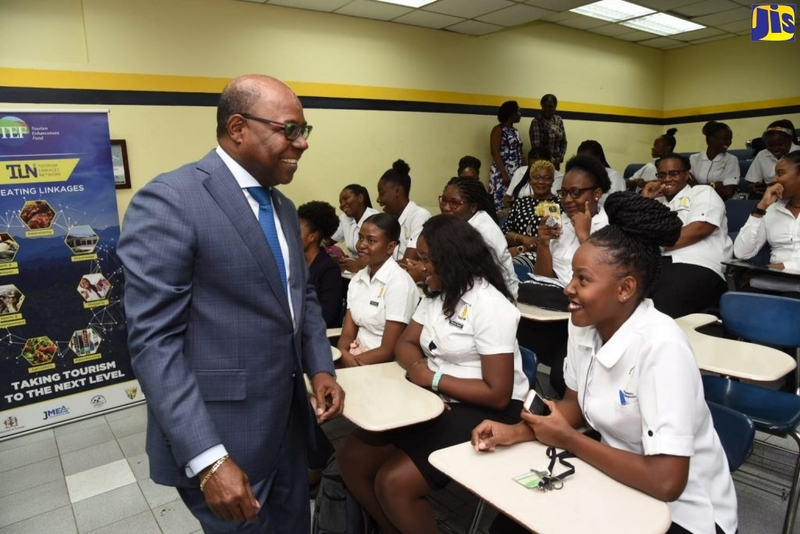 Minister Grange said continued support will be provided to women’s groups and gender-related entities, such as the Jamaica Household Workers Union (JHWU). Minister of Culture, Gender, Entertainment and Sport, Hon. Olivia Grange, made the disclosure at a business forum in commemoration of International Women’s Day, held recently, at the Knutsford Court Hotel in New Kingston. It is in keeping with an action plan for gender equity and sustainable development in Jamaica, to be rolled out in the short term. Legislated quotas will also be introduced to address the under-representation of women in local authorities and other positions of leadership, and to increase the participation of women in the relevant branches of governance and socio-economic organisations. The plan also includes ratifying Convention 189 on Decent Work for Domestic Workers, and ongoing training to facilitate capacity-building and institutional strengthening of the JHWU. Minister Grange informed that strategic interventions will also be undertaken to build on gains achieved, particularly in areas covered by the Beijing Declaration for Action (BPfA), which is aimed at advancing women’s rights. She said the action plan includes revision of existing legislation, to make them gender neutral and compliant with the language and guiding principles in the National Policy for Gender Equity (NPGE), as well as commitments to regional and international agreements. The International Women’s Day event was organised by the Bureau of Women’s Affairs (BWA) in partnership with Cuso International, and the Management Institute for National Development (MIND).